MEPIS (/ˈmɛpɨs/) is a set of Linux distributions, distributed as Live CDs that can be installed onto a hard disk drive. MEPIS is developed and maintained by an active community begun by Warren Woodford and the eponymous company MEPIS LLC. The most popular MEPIS distribution is SimplyMEPIS, which is based primarily on Debian stable. It can either be installed onto a hard drive or used as a Live CD, which makes it externally bootable for troubleshooting and repairing many operating systems. It includes the KDE desktop environment. MEPIS LLC offers senior consulting services for product strategy, architecture design, business and systems analysis, and cross-platform software development. Ubuntu is designed primarily for use on personal computers, although a server edition also exists. Ubuntu holds an estimated global usage of more than 20 million users, making it the most popular desktop Linux distribution. It is fourth most popular on web servers, and its popularity is increasing rapidly. Ubuntu is sponsored by the UK-based company Canonical Ltd., owned by South African entrepreneur Mark Shuttleworth. Canonical generates revenue by selling technical support and services related to Ubuntu, while the operating system itself is entirely free of charge. The Ubuntu project is entirely committed to the principles of free software development; people are encouraged to use free software, improve it, and pass it on. 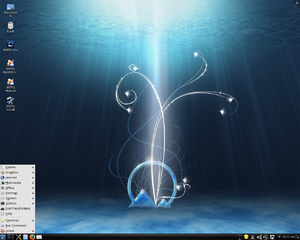 MEPIS was designed as an alternative to SUSE Linux, Red Hat Linux, and Mandriva Linux (formerly Mandrake) which, in the creator Warren Woodford's opinion, were too difficult for the average user. MEPIS's first official release was on May 10, 2003. In 2006, MEPIS made a transition from using Debian packages to using Ubuntu packages. SimplyMEPIS 6.0, released in July 2006, was the first version of MEPIS to incorporate the Ubuntu packages and repositories. SimplyMEPIS 7.0 discontinued the use of Ubuntu binary packages in favor of a combination of MEPIS packaged binaries based on Debian and Ubuntu source code, combined with a Debian stable OS core and extra packages from Debian package pools. Warren Woodford released the source code for the MEPIS Installer and MEPIS System Assistants under the Apache License, in the Fall of 2008. Major releases occur about six months to one year apart, based mostly on Warren's availability to produce the next version. MEPIS Community now has a repo team that strives to keep packages up to date between releases, by maintaining a separate 'Community Repository' of various application packages, and has become a major player by producing the artwork and documentation for each release. SimplyMEPIS, the most popular MEPIS variant, is designed for everyday desktop and laptop computing. The default desktop environment is KDE-based, although Gnome and/or other GUI-environments can be installed. SimplyMEPIS 11.0 includes Linux 2.6.36.4, KDE 4.5.1 and LibreOffice 3.3.2, with other applications available from Debian and the MEPIS Community. It was released on May 5, 2011. It is based on Debian 6.
antiX, a fast, lightweight and flexible distribution available in full, base or core editions and based on SimplyMEPIS for x86 systems in an environment suitable for old computers that features the Fluxbox and IceWM window managers. Version M11 was released on 2 May 2011, It is now a true 'rolling-release-cycle' Linux distribution, and thus continues to remain current. It is based upon the standard Debian repository named 'testing'. According to Warren Woodford, the name MEPIS is pronounced like "Memphis", with the extra letters removed. Originally, the word "MEPIS" didn't mean anything in particular; it came about by mistake. When Woodford misunderstood a friend over the telephone, he decided to use the name because it was a simple five-letter word and there were no other companies or products with that name.